Nobody’s talking about platinum. No one cares about it. You can see that it’s down 61% since its high in 2008. Now, I realize that sounds like a reason to avoid platinum. But you should understand something about Dave. 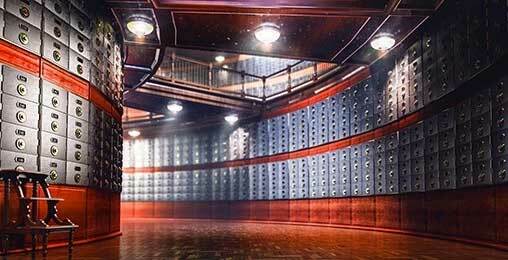 Your bank certainly doesn’t want you to know about THIS new investment. Banks just can’t compete with these investments. Like Doug Casey, he likes to buy assets other investors want nothing to do with. This allows him to pick up world-class assets for dirt cheap… and ride them to huge gains once sentiment changes. And platinum is easily one of the most hated assets on the planet right now… though it may not be for much longer. As you’re about to see, platinum isn’t just cheap—it’s irrationally cheap. At this point, it offers massive upside with little downside risk. In a minute, I’ll show you how to take advantage of this situation. But first, I should tell you what Dave and I were doing in Bermuda. This conference brought the brightest minds in our business together. Doug Casey, Bill Bonner, and Mark Ford were in the building. I also heard eye-opening speeches from Crisis Investing chief analyst Nick Giambruno, Palm Beach Confidential editor Teeka Tiwari, and Delta Report editor Jeff Clark. 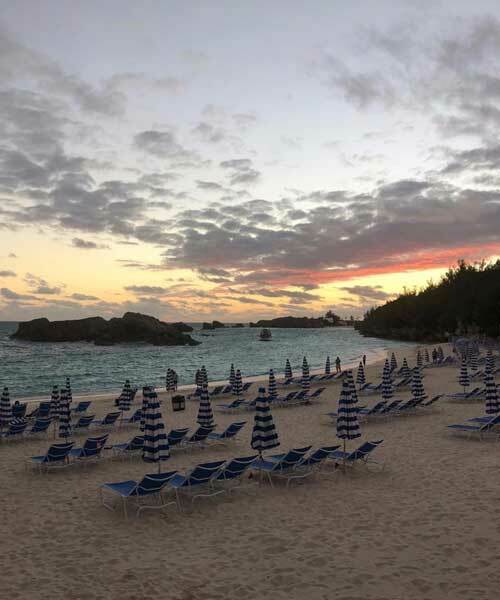 But some of the best insights I walked away with came from outside of the conference hall… when I was enjoying drinks and dinner with some of our industry’s top gurus. That’s when Dave and I got on the topic of platinum. I’m going to let you in on that conversation in today’s Dispatch. I’ll tell you why Dave’s so bullish on platinum… And I’ll show you the best way to profit from higher platinum prices. Here’s why it pays to listen to Dave. He has spent his entire 20-year investing career searching for new discoveries and breakthroughs. He has also founded his own mineral exploration and development companies, raising over $80 million in equity financing from some of the most well-known resource investors in North America. Dave credits his success in the resource space to experience, his connections, and technical background. But part of his edge is a time-tested method for identifying commodities with the most upside. Right now, that industry-tested method is showing that platinum is a screaming buy. 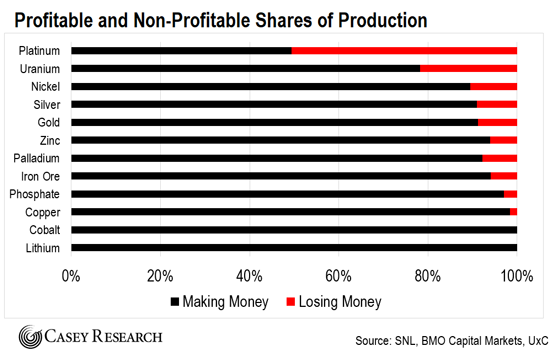 As you can see, the price of platinum is so low that half of the industry is unprofitable. And that’s exactly what Dave looks for. I know that’s counterintuitive. After all, most investors like to invest in businesses that are making money hand over fist… not ones that are bleeding cash. But situations like this are a recipe for much higher prices… and ultimately fat profits. Think about it. 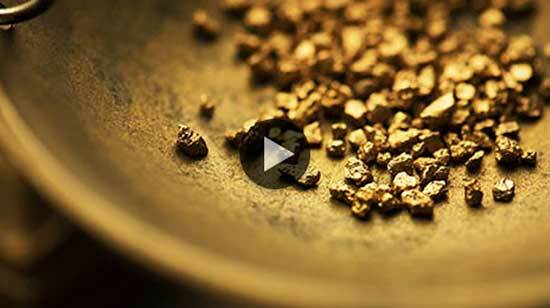 If the price of platinum doesn’t rise, miners will be forced to shut down mines. That will cause the supply of platinum to contract, which would cause prices to rise, assuming demand doesn’t decrease. But that’s not the only reason to be bullish on platinum. (Shocking) The US is 55th in What? South Africa produces about 70% of global supply—and that country is seeing increasing government take from mining operations as taxes rise. 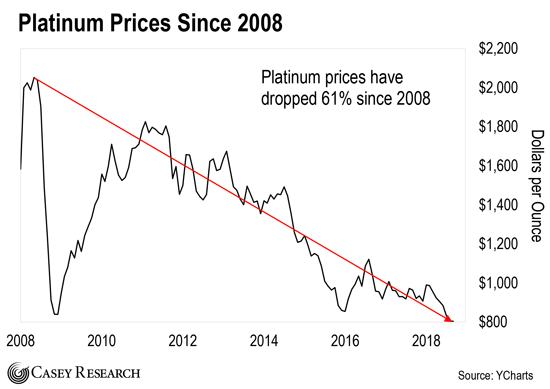 Add that to the fact that South Africa’s mines are generally old and exceptionally deep (up to a few kilometers in some cases), and mining costs here are on the rise—at a time when platinum prices are at a historic low. So consider betting on higher platinum prices if you haven’t yet. You can easily do this by buying the Aberdeen Standard Physical Platinum Shares ETF (PPLT). This fund tracks the price of platinum. Just understand that this is a speculation. Mining stocks are volatile. As always, keep your position sizes small… and never bet more money than you can afford to lose. P.S. Platinum isn’t the only investment opportunity that Dave’s excited about today. He recently released an important video that reveals one of the biggest trends you’re probably not hearing about today. In short, America is switching to a new, higher grade of oil. It’s called “Brandt Oil”—and it can power everything we use—cars, homes, buildings, and machinery. Not necessarily misused as both gallons and barrels of oil exist. What’s disingenuous is when reporting/writing about oil, is that it’s priced, bought, and sold in barrels, but if spilled, gallons are spilled. Hi Doug, enjoyed your piece on fake language; it’s a beef of mine since forever. Another one is to interchange “brain” and “mind.” First, it’s not the same word. Second, it’s not the same thing. You can hold a brain in your hand. The mind is pictures with emotions, and you can’t have one in your hand. And it’s more powerful than the brain. Another phrase is “protecting our country.” That’s more a concept than just a phrase. It justifies for many that it’s OK to take a weapon, attack other countries, kill people, and steal their goods.